Example programs and schematic for a 10-bit serial datalogger unit. 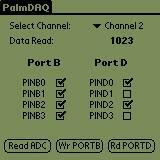 Uses a Atmel ATMega16 AVR and a RS-232 link that is controlled with a Palm. Example applications and source code for I/O control, graphing, and sampling are provided.